I Can’t Homeschool Because My Kids Need Socialization… really? Homeschool kids ARE socialized. If anything, we are too social because we try to make up for the perceived “lack” of socialization. 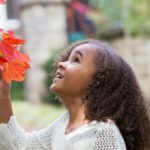 Homeschool socialization is not a myth, believe me! I calmly respond, “Oh, we homeschool”. “Oh, wow! I have thought about doing that, but I never could. My kids NEED socialization”. She smiles, gets up, and walks away. This happens to me ALL the time, and chances are if you homeschool, it has happened to you too. I want to run after them and say “Do you not SEE my kids right here, playing?” But, I don’t. Because honestly preaching to a person is not going to make a difference. They have their minds made up on socialization, and I am not going to change it. However, if you are really, truly concerned about homeschool socialization, and if that is really, truly why you are hesitant to homeschool, then I am here to reassure you. Homeschool kids ARE socialized. If anything, we are too social because we try to make up for the perceived “lack” of socialization. That is not counting church three times a week, or extra things like playdates, church activities, birthday parties, family trips, or other things that do not happen on a regular basis. They are socialized. Believe me. I can promise you, your kids will be too. Socialization is the process by which human infants begin to acquire the skills necessary to perform as a functioning member of their society, and is the most influential learning process one can experience. Unlike other living species, whose behavior is biologically set, humans need social experiences to learn their culture and to survive. For most of us, socialization comes naturally. It comes from being around other people and means that the person is able to function in society. You do not have to send your child to public school to socialize them. If you are thinking to yourself, “Yes, but I met this kid this one time who was homeschooled, and he was just WEIRD, I don’t want my kid to be that way”. Then, stop and think back to public school. Were there any weird kids there? Chances are, yes. You know why? Because being homeschooled did not make that kid weird that was in his DNA. Chances are he would have been just as “weird” in public school. So, what is the importance of socialization in school? The truth is it is public school socialization is not going to always be good. There are things kids are exposed to early, that they should not have to deal with. Homeschool socialization is different. When our kids get together, there are always a number of moms around to diffuse a situation. Also, most of the time, the families have similar beliefs as we do, so we don’t worry about what our kids are being exposed to. Does this mean homeschool socialization is always good? No. 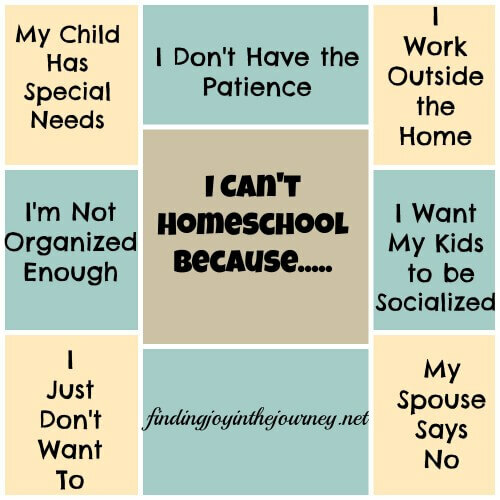 We have had to deal withchild socialization problems and even “mean girl” issues despite being homeschooled. We have had to have conversations about appropriate and inappropriate behavior. But, I was there. I knew about it, and I knew the parents of the children involved. So, it was able to be handled by me and the other parent appropriately. This does not always happen in public school. If you decide to homeschool, you will probably still worry about socialization, it is normal. It takes an effort to get out, make friends, and be involved. You will have to find other homeschoolers, and a group to be involved in. These can be found just about anywhere, and if you can’t find one, then consider starting one of your own. 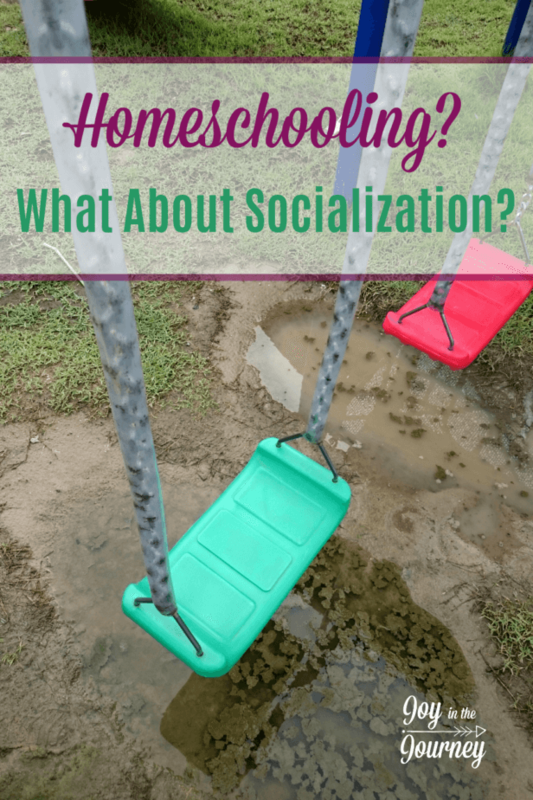 Is there a Lack of Socialization in Homeschooling? If you are looking for homeschooling and socialization statistics be sure to check out the research completed by the NHERI. Socialization takes time, and effort, but it is really not that different in homeschooling than in public school. Also, believe me when I say, don’t NOT homeschool because you are worried about socialization. Socialization is natural, it happens, and it does not require a public school building. Make sure you come back next week for the final post in the I Can’t Homeschool Because…. series where I will be addressing YOUR questions and concerns! Great article! Homeschooling children can be well socialized both in terms of learning to navigate social situations and in terms of having adequate social interaction for their development. But we can’t assume that it will happen automatically. We as parents must lookout for new opportunities, and be willing to make changes if things aren’t working. Thanks for your ideas! I don’t homeschool… yet. My daughter is still too young, but I was homeschooled my entire childhood (with the exception of 5th grade). This really hit home. I always hated hearing other parents claim my brother and I weren’t being properly socialized since we were homeschooled. My husband recently came home from work and told me homeschooling had been brought up in the office. My husband went to public school and I think he is more insistent that we homeschool than I am! His boss was telling him that homeschooling was bad because the only way to PROPERLY socialize a kid is to have them in public school. That nothing can replace the kind of socializing that happens in school. But oddly enough, here I am in my late 20’s… somehow capable of socializing with people even though I didn’t spend much time in school. Exactly! I don’t know where people get their information. If anything I think most public schools are NOT what I would want for my kids when it comes to socialization…. We are in our 18th year of homeschooling and as funny as it seems, I never worried about socialization. One reason may be because we started out in public school, and though my daughter was an excellent student, there were still issues with bullies and such. Being in a classroom with 20+ other children all the same age is not only not a good experiment in socialization, but it isn’t even “real life”. At what other season in any person’s life would they be isolated to a peer group all the same age? We didn’t join any homeschool groups or co-ops (and only became affiliated with a local group just a few years ago). We do attend a small church once a week. We also visited nursing homes and such, to minister to the residents and stopped by the public library weekly. And the older girls did take music lessons as well. But that was about it as far as activities outside the home. I must say, for the lack of social opportunities that were afforded our children as they grew, they are very comfortable in just about any setting and can easily converse with children, teens, and adults alike. Our 5 older girls have a singing ministry and are very comfortable performing in front of large crowds. This is an excellent series, Misty in bringing light to the objections and fears some may have regarding homeschooling. Good job! I homeschooled my kids K-12. They went on to university. They thrived. My daughter now works in Japan and my son is a manager in a lab. The question isn’t, “How will my children be socialized?” It’s “By what will my children be socialized?” Sports, jobs, volunteering, supervised group get-togethers- these socialize your children. Both homeschooling and public schooling require work. 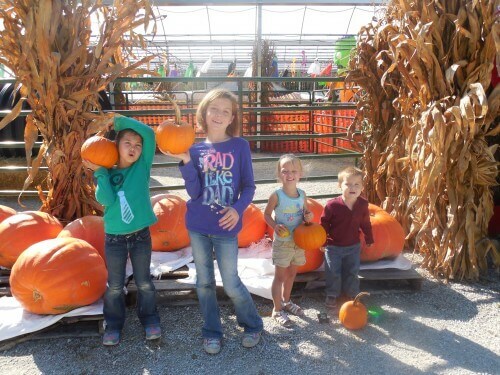 Work for the homeschool mom to provide opportunities to experience different social settings. Work for the public school mom to intervene and monitor if and how your child is being socialized – does it meet your value system, is it a safe space so that education and not self-preservation is the focus? I have severe social anxiety. I have to force myself to take the children to events. FYI, the struggle is real for some of us. I would have to deal with this issue if they attended public school as well. I choose to home school and face this challenge with God’s help. Also living in an area full of co-ops and other home school activities is a benefit that not all of us are afforded. Just my two cents. Hi Susan! So sorry you struggle with that, but so glad we have a loving Father who is helping you through <3 As far as the co-ops and homeschool activities being a benefit, I agree wholeheartedly. When I first started homeschooling the nearest co-op was an hour away. The other mom I knew who homeschooled met with a few moms once a month. No activities, just a day of play and all the kids were older than my kids. So, I started a group myself. I truly believe this is an option for most moms who may not have the benefit of local groups. We have been together for 5 years and are still finding moms in our community who homeschool that didn't know we existed. It's amazing really to find so many homeschoolers when you think you live in a fairly small area. So, for the moms out there who don't have the benefit of a large group consider starting one yourself! What a fantastic series! I am pinning this! I appreciate this post. I won’t homeschool myself, but I don’t devalue the process, effort, or education. I believe in afterschooling. 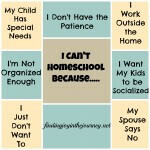 As a 17 year veteran of homeschooling, some of the excuses people give for not homeschooling make me laugh a little. I’m not organized or patient, and some days I really don’t want to! But we do it anyway. 🙂 I hope your series makes an impact on newbies and those considering homeschooling.